I’ve just finished reading Better Together, the latest book from Irish author, Sheila O’Flanagan and it has not disappointed in the least. It’s another wonderfully absorbing tale from this fabulous writer that had me hooked from the very first page. The story is enjoyable and intriguing and the main character is strong and likeable. This book has all the right ingredients for a great read. Better Together starts in Dublin where Sheridan Gray is a successful sports journalist on one of the city’s newspapers. Unfortunately, there is a recession and no one’s job is safe. It still comes as a complete body blow to Sheridan though, when she is made redundant. There seem to be very few job opportunities at this time though so she eventually compromises on her aspirations and takes a job with a small local newspaper in the little town of Ardbawn. In a strange twist of fate, this paper is owned by Paudie O’Malley who was the person responsible for her losing her Dublin job. Sheridan does not really expect to enjoy life in Ardbawn but before long she is getting to know the locals and finding working on a small newspaper strangely satisfying. She also gets to know the woman who runs the guesthouse she is staying in – Nina – who has troubles of her own. There’s also a strong whiff of romance so it’s hardly surprising that Sheridan stops hankering after her hectic city life. However, when the possibility of writing a sensationalist story arises that will obviously upset the people she has come to know, she is torn. Does she give up all that she has found in order to achieve her big break? You’ll have to read Better Together if you want to find out! 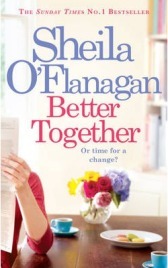 Sheila O’Flanagan has written a great story in Better Together and I absolutely loved it. There’s a very strong storyline with many different themes interwoven. I really enjoyed the backdrop of Sheridan working on a newspaper and the story did make one think a bit about newspaper ethics. All the different stories work together very well and there is also a tantalising mystery that is unpicked little by little. It is a very well written book. The characters are also very well depicted and I enjoyed finding out more about them as the story progressed. Sheridan was a great main character as she is quite feisty and strong minded and it was entertaining to see how her attitude towards living in a small town changes over the course of the book. I liked her and therefore cared about what happened to her in both her professional and personal life. I also liked reading about her differing relationships with the other characters especially when there was a bit of a fallout! Overall, Better Together is a very satisfying read and one that left me wanting to read more. I always enjoy Sheila O’Flanagan’s books and Better Together is definitely up there with the best. With thanks to Headline for sending a review copy. No Comments on "Better Together"